EAST TEXAS (KLTV) - Sgt. 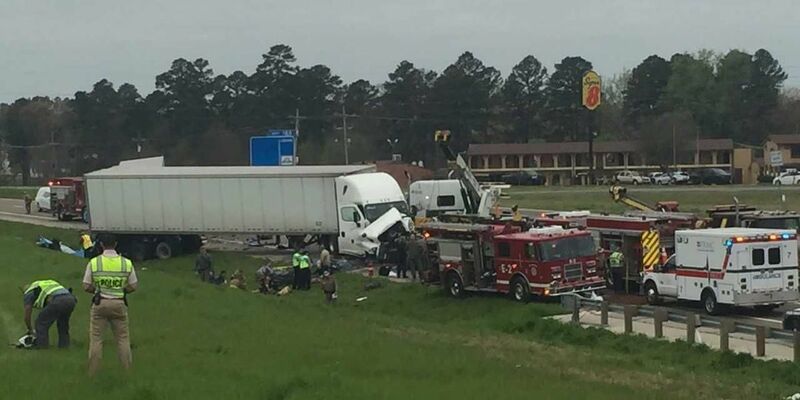 Sylvia Jennings with the Texas Department of Public Safety has released the identities of those killed in a wreck on the interstate near Mount Pleasant on Friday. The driver of a 2018 International semi-truck and one of five vehicles involved in yesterday's crash on IH-30 at mile marker 162 in Mount Pleasant, has been identified as Wanda Gebhart, Jennings said. Gebhart, 64, was from Pikeville, Tennessee. She was pronounced dead at the scene, Jennings said. The minivan in which three children and their mother died was a 2011 Toyota Sienna, and was the first vehicle to be struck in the crash. The driver of the Toyota, Jeffery Brokish, a 42 year old from Savoy, Illinois, was transported by air ambulance to a trauma center in Tyler. Jessica Brokish, 41, and two sons, ages nine and six, as well as a two-year-old daughter, were pronounced dead on scene, Jennings confirmed. The third vehicle struck in the wreck, a 2016 Freightliner semi-truck, was driven by Carlos Vela Martinez, 42. Martinez and a passenger, Juan Martinez, 20, both from San Jose Santillio, Mexico, were transported with minor injuries to Titus Regional Medical Center in Mount Pleasant, according to DPS. The fourth vehicle struck, a 2007 Volvo semi-truck, was driven by Ravshan Sayfetdin Ibragim, 43, from Dayton, Ohio. Ibragim was also transported with minor injuries to Titus Regional, according to Jennings. The fifth vehicle struck was a 2015 Volvo semi-truck, driven by Abdul Rahman Al-Shaibani, a 53-year-old male from Stanwood, Washington. He was transported with minor injuries to Titus Regional. The incident began when a U-haul overturned on Friday morning, blocking traffic on the interstate in the eastbound lanes. About an hour later, three 18-wheelers failed to stop for that wreck, clipping one another. The fourth semi plowed into the back of a minivan, sandwiching the van in between the third and fourth semi, according to DPS. Sgt. Jennings said the investigation is ongoing. Stay with KLTV and KLTV.com for updates.